“Flat-type” body. Wires are 16 ga., 44" (117.76cm) long. “Flat-type” body. Wires are 10 ga., 12" (305mm) long. “Flat-type” body. Wires are 16 ga., 24" (610mm) long. Tests 4-Pole Connections for conductivity & viability of circuits. “Flat-type” body. Wires are 18 ga., 24" (610mm) long. “Square-type” body. Wires are 16 ga., 24" (610mm) long. Compact, lightweight, yet rugged for use in recreational vehicles, trucks, buses and marine applications. 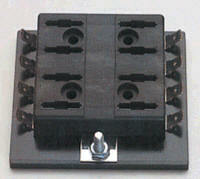 Accepts blade-type ‘ATO/ATC-Style’ Blade Fuses or automatic or manual circuit breakers. 30 amp maximum rating per branch circuit. Six to ten branch circuit terminals and stud common ground. No top cover is needed. Recessed fuse contacts. Molded of high grade thermoplastic. Rated to 105° C (221° F). Recessed mounting holes. For SFE-20 amp or 3 AG (AGC) type fuses, 1⁄4" (6.4 mm) dia. x 1 1⁄4" (31.8 mm) long. Screw terminals with binding head terminal screws. Phosphor bronze fuse clips, hard fiber insulator base. 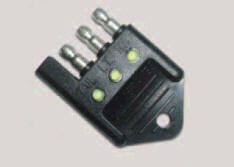 Fuse clips with screw connections simplify installation and eliminate excess wiring. Solid brass bus bar for use with SFE-20 amp or 3 AGC type fuses. 4 1⁄4" x 2 1⁄4" x 5⁄8" (108.0 mm x 57.2 mm x 15.9 mm) 11⁄64" dia. (4.4 mm) mounting holes.